INDIAN presence in this region can be divided into two distinct stages both of which involve the exchange of people, goods and philosophies albeit in varying proportions. 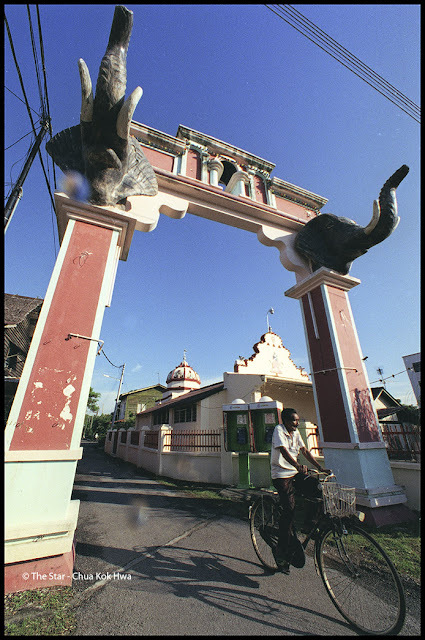 The Malay peninsula's initial association with Indian culture dates as far back as the fifth century. These ties were predominantly related with commerce. However, the last 160-odd years, and by far the most significant period of migration, was basically tied in with the export of labour. While earlier Indian contacts with Malaya were motivated by individual needs,the consequent movement of Indians to this country during the 19th century was to serve the interests of their colonial masters. The most significant wave that influenced the face of Malaysian Indians till this very day commenced with the influx of manpower in the 1830s, when Indian labour, rumoured to have started with convicts, were brought into the country to work firstly in the sugar and coffee plantations and, later, rubber, tea and, eventually, oil palm. Along with workers for the plantation sectors, other groups also trickled in to take up menial labour work. Sepoys and domestic servants were also brought in by the British and settled in the Straits Settlements. By 1870 there were 30,000 Indians in Malaya, not including earlier migrants who had already been assimilated with Malay communities. The size of the population parallelled the ebb and flow of the demand for rubber and later oil palm, fluctuating between 75,000 in 1891 and 625,000 by 1931. These labour forces would also be seconded to various government undertakings: public works, municipal services as well as road and rail construction. While labourers remain by far the most numerous immigrants throughout the migration of Indians to Malaya, there were also significant numbers engaged in commercial pursuits and in professional and clerical employment. For example, the clerical services within the growing British bureaucracy were manned by the Ceylon (now Sri Lanka] Tamils. Those who came to Malaya had either worked with British officers in Ceylon who had been transferred to Malaya or were beneficiaries of the superior network of secondary schools established in north Ceylon by missionary organisations. Together with fellow Ceylonese from villages in Jaffna, they were eventually concentrated in certain fields of service such as the railways, public works, postal services, accounts divisions and the Treasury. The 20th century heralded the first influx of middle-class Indian migrants with young, educated Matayalis from Kerala and the Malabar districts of the Madras state moving in to dominate in private sector posts within European firms and the plantations. Educated individuals from other Indian communities also began to descend on Malaya around this time, including professionals like doctors, lawyers, journalists and teachers - all with high expectations. Another category of non-labour groups were the Punjabis and other North Indians, who were recruited to the police, security services in various governmental departments and as technical personnel for the railways. Simultaneous with this influx was the arrival of various categories of traders - lineal successors to some of the earliest Indian adventurers to this land. Parsees, Sindhis, Marwaris and Gujeratis set themselves up - from large-scale businessmen to tallest peddlers. And one must acknowledge the pivotal role played by the South Indian Muslim businessman as far as retail trade in the peninsula is concerned. They retailed all goods of Indian origin, taking full advantage of the mass migration of Indian labour. They were also among the first Indians to move into the Malay states and, because of their deep Islamic ties, established bonds with the Malay communities which have prospered till this very day. 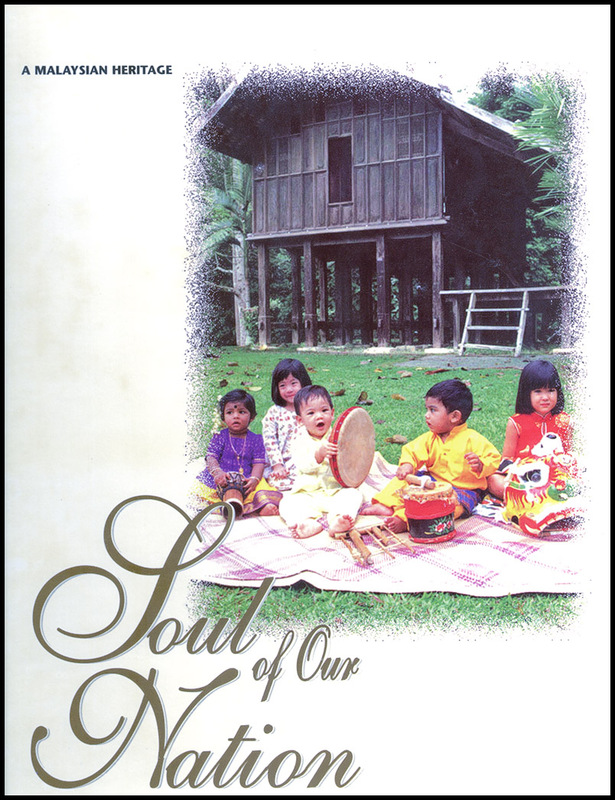 The Chettiars are another prominent community that has flourished in modern Malaysia. Reputed for being trustworthy businessmen, they extended their influence through money-lending activity that was immensely crucial in the expanding economy that was Malaya. All in, Malaysian Indians are a colourful and dynamic mix of peoples who may not always have seen eye to eye but have nevertheless evolved into a dynamic and crucial component of Malaysiana. Telegus, Malayalis, Bengalees, Punjabis, Hindus, Christians, Muslims, Buddhists, Jains, Tamils, Saivist... the list is endless and all have played their part in being a part of this country's rich past and even richer future. They revel in their differences but understand each other more than they would care to admit. * Text taken from page 84 to 86 of "Soul Of Our Nation" under Indian Community. A family bathes in the river during Thaipusam as part of the cleansing ritual before climbing the 272 steps of Batu Caves in Kuala Lumpur. 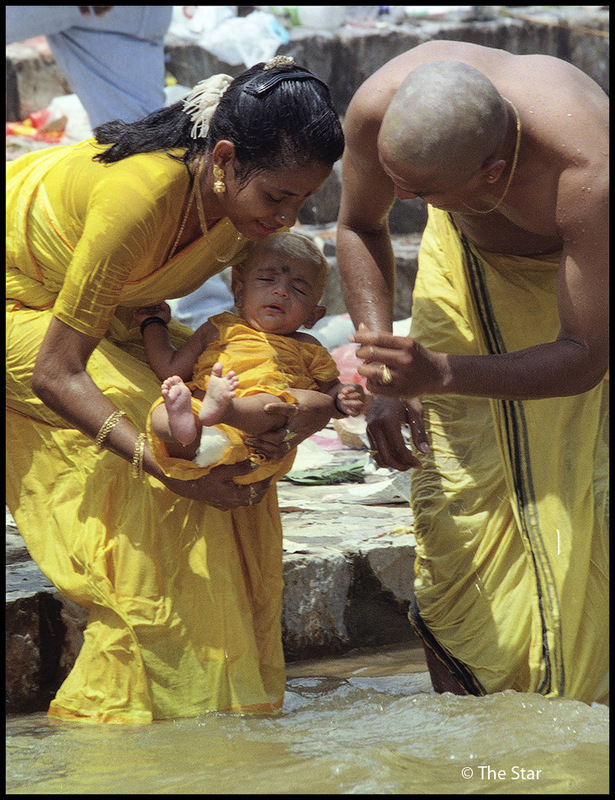 Saffron coloured garments are worn as a symbol of purity. It is during this occasion that vows made to Lord Subramaniam are fulfilled. Thaipusam is a Tamil-Hindu celebration observed on a grand scale because of its deep religious significance. It is celebrated during the month of Thai when the star of Pusam is on the rise. Thousands of Hindu worshippers throng Batu Caves every year on Thaipusam to pay homage to Lord Subramaniam, one of the more popular deities in their religion. Coconuts are broken for purification purposes and fires are lit with camphor to destroy the ego and purify the soul. 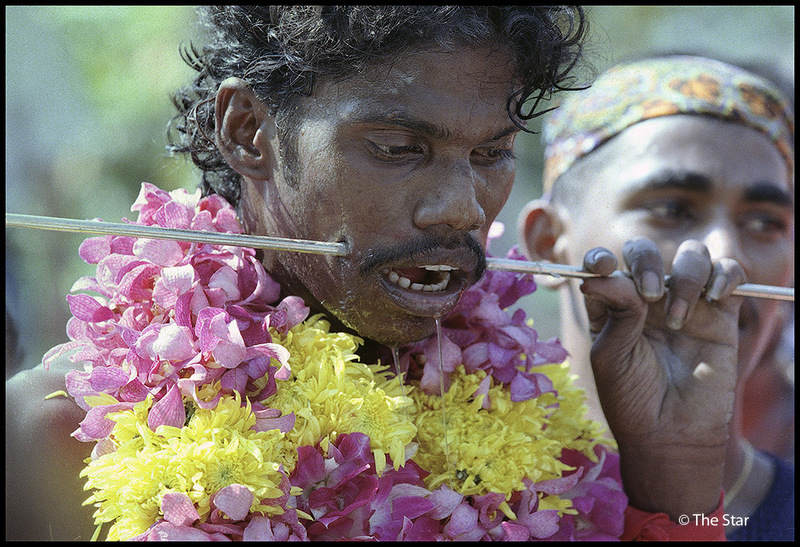 A devotee with pierced cheeks fulfilling his vow made to Lord Subramaniam during the Thaipusam celebration. Babies, small children as well as adult Hindus take the opportunity to shave their heads during the auspicious occasion of Thaipusam. Every year in April the Chitty community celebrate the 'parchu' festival in homage to their ancestors. Cooked food such as meat, vegetables, fruits and sweetmeats are laid out on banana leaves and prayers are offered in remembrance of the ones who have passed on. An arch decorated with carvings of elephants marks the entrance to Kampung Gajah Berang, home to one of the oldest of Malaysian communities, the Chittys. Chittys are believed to be descendants of wealthy Indian traders from the Coromandel coast of Kalingapatnam in south India. They came to the Malay peninsula during the Malacca Sultanate, settled down, adopted local customs and married local women. The traders were staunch Hindus but they assimilated elements of local culture, including adopting Malay as their mother tongue. About 60 Chitty families still live in Gajah Berang, Which is more popularly known as Kampung Chitty. 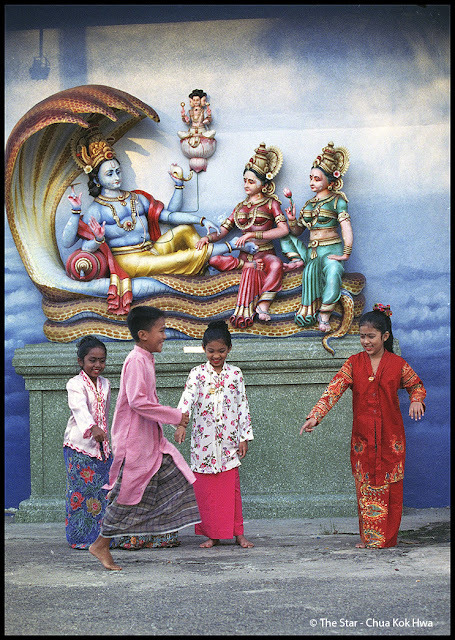 Children play in the vicinity of the Chitty temple in Kampung Gajah Berang, Malacca. The planting of a tree (kalyana murugai) is an important part of a Sri Lankan Tamil pre-wedding (ponnuruku) ceremony. The sapling is taken from a tree in the garden of a married person. 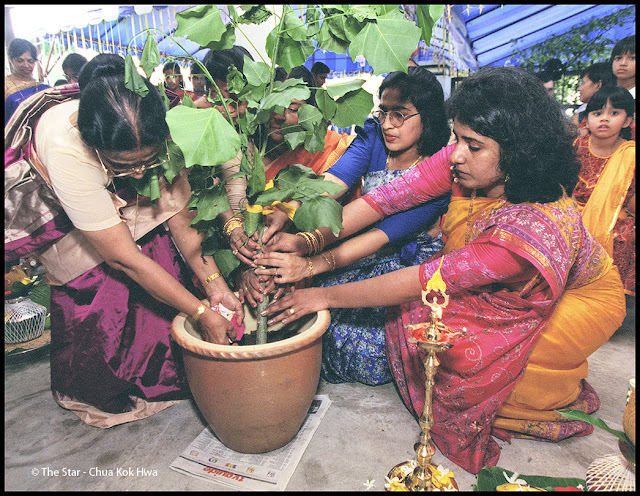 Once the sapling grows, it cannot be chopped down until a small part of it is used for another ponnuruku ceremony. 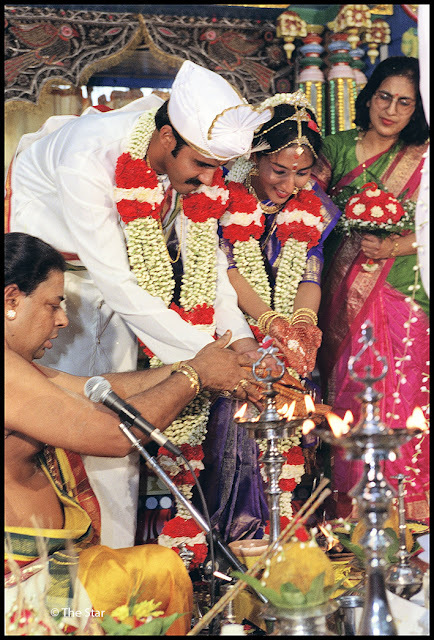 In a Sri Lankan Tamil wedding ceremony, the performance of symbolic and significant rituals is essential for a blessed married life. 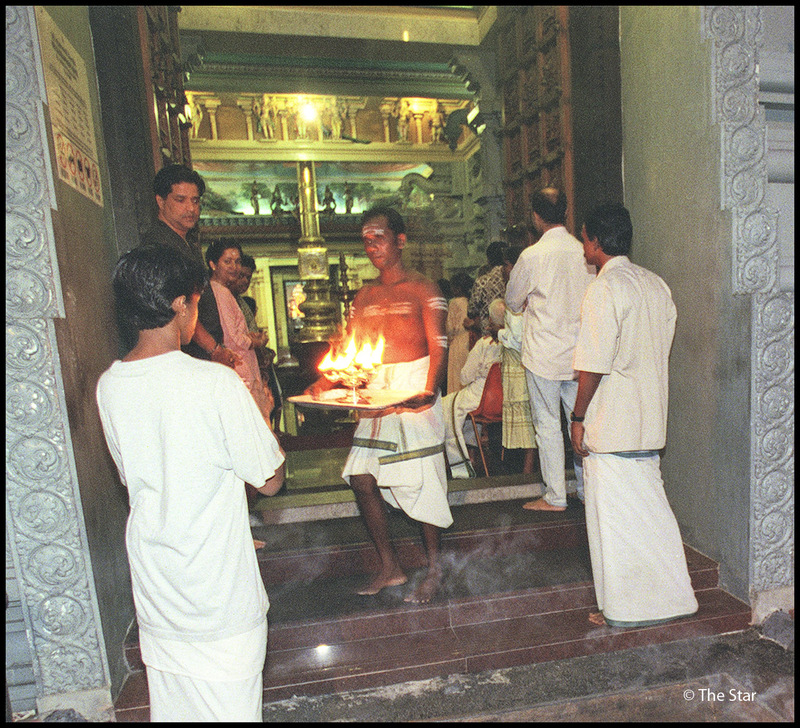 Sri Lankan Tamils perform the Panchaalarthi at the Sri Kandaswamy Temple in Jalan Scott, KL, daily. Strict adherence to religion and the pursuit of education are the main themes in the Sri Lankan Tamil way of life. Members of the Singhalese community in the midst of a dana sanghika ceremony. 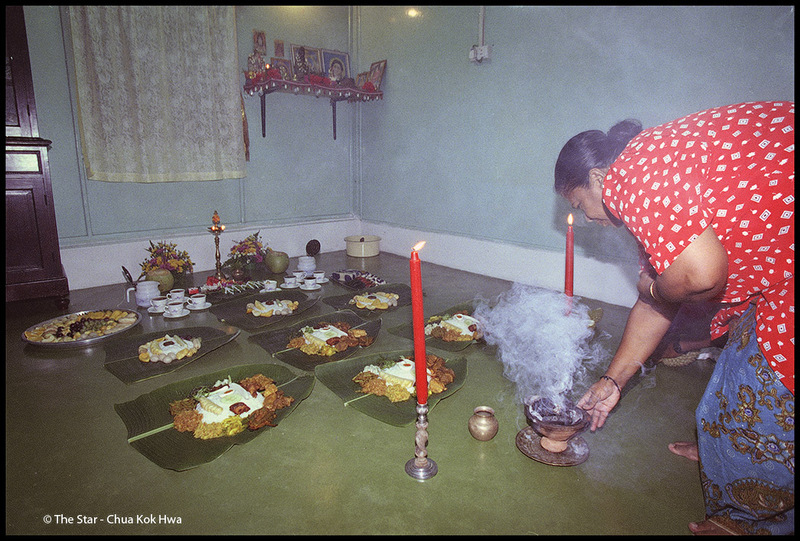 Descendants of Sri Lankan Singhalese who came mainly as jewel merchants to Singapore and Penang, majority in the community are Theravada Buddhists who still observe the custom of performing acts of charity (dana) to their monks. charitable deeds by a living member of the family, as symbolised by offering food and gifts to monks. This is believed to be vital for the dead person's next karmic evolution. A young woman sits patiently while her hands are decorated with henna. This ritual is part of the pre-wedding Sangeet ceremony to beautify a Sikh bride-to-be in preparation for her wedding. 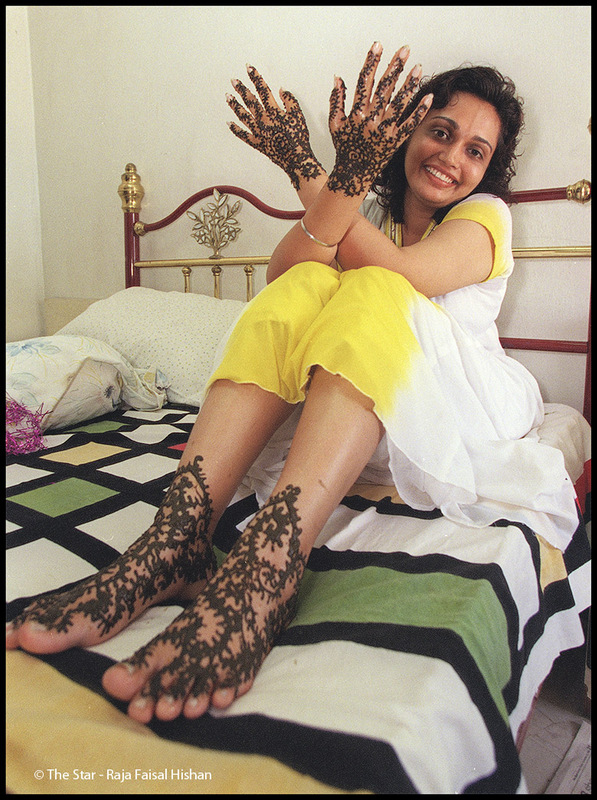 Besides the hands, the feet of Sikh maidens are also decorated with intricate patterns as part of her bridal accessory. A Sikh bride-to-be has many pre-wedding ceremonies to get through. One of these is the mainya oil ceremony. The young lady is cleansed with oil, yoghurt and horsegram flour to make her skin fair and bright on her wedding day. Sweet yellow rice is fed by the Sikh bride-to-be to young unmarried women. This signifies her hope that they will also get suitors for themselves just as she has. It is also intended to involve the younger generation in the wedding rituals which are normally conducted by the elderly folk. 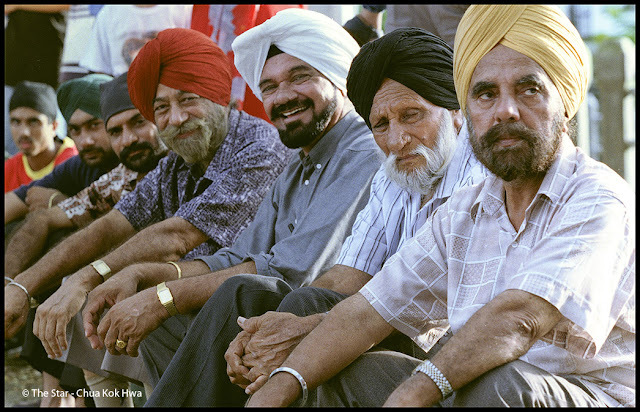 These men are easily distinguishable from the rest of the population by their turbans. 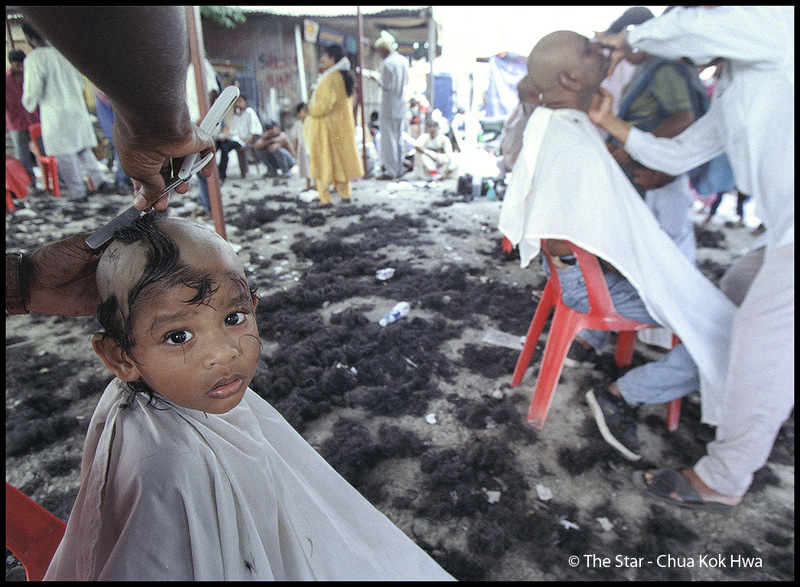 Wearing the turban is an integral part of the faith of the Punjabi Sikhs whose hair must not be shown. In the spirit of tolerance and respect for all religions, Sikhs in Malaysia are permitted to wear the turban at all levels, including the armed forces and police. At their request, they are also exempted from wearing crash helmets when riding motorcycles. Numbering over 87,000, the Punjabi community is also made up of Muslims and Hindus. First brought in by the British as Malay State Guides in 1873, they were members of the early police force who enforced the tow against the kongsi-kongsi gelap. administration into the professions and businesses such as textiles. The Gurdwara (temple) is the focal point point of life for the Sikhs. 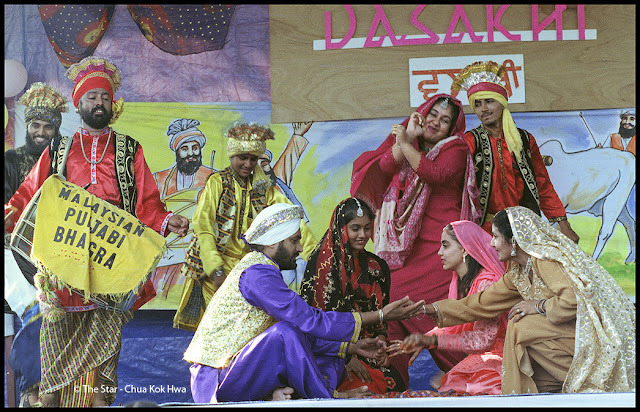 Vasakhi (Punjabi New Year) which falls on April 13 is celebrated with much merry-making, with song and dance-drama parties being held in every Punjabi community. Here is a dance drama scene about lovers meeting secretly in the bazaar while the maiden's mother and sisters haggle with a trader who is selling bangles. 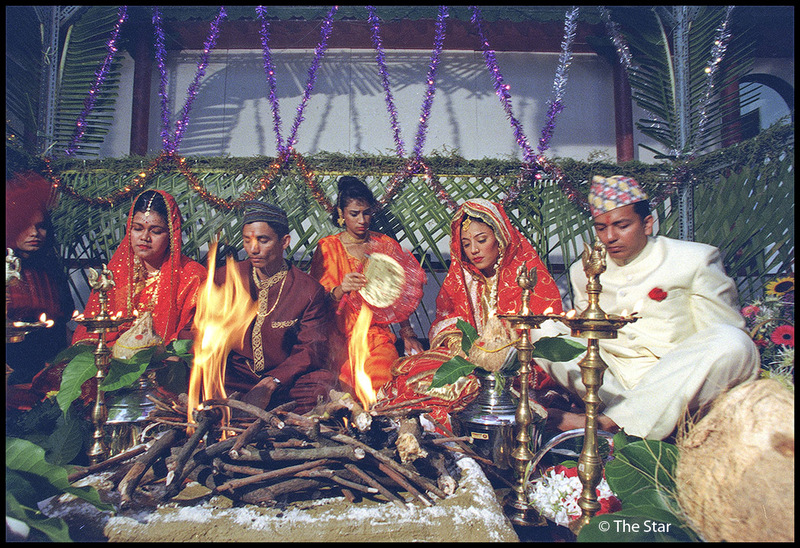 The Hindu-Gurkha weddings, the element of fire (Agni) is important. 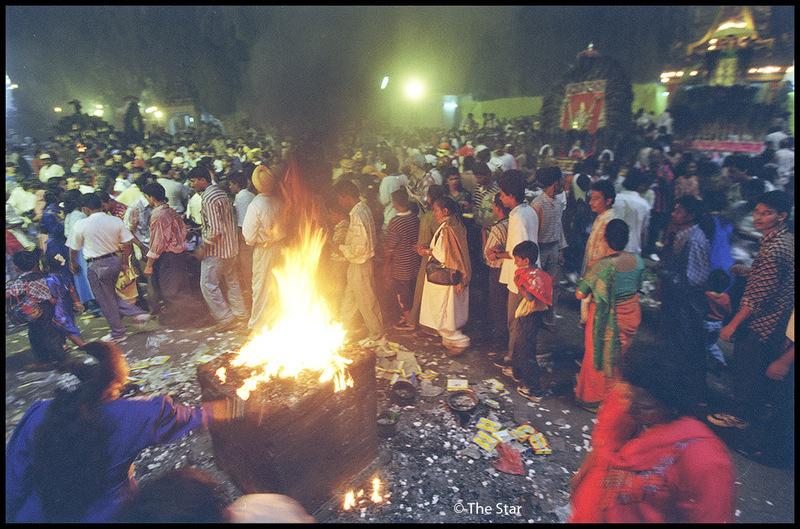 The sacred fire is a symbol of the destruction of the ego and purification the soul. of Gurkhas who were first brought in as soldiers from the plains of Gorkha, in West Kathmandu, Nepal during the Malayan Emergency (1948-1960). Numbering about 600, the small community is popularly known as Gurkhas because of association from the past. They are actually of Hindu-Nepalese origins. 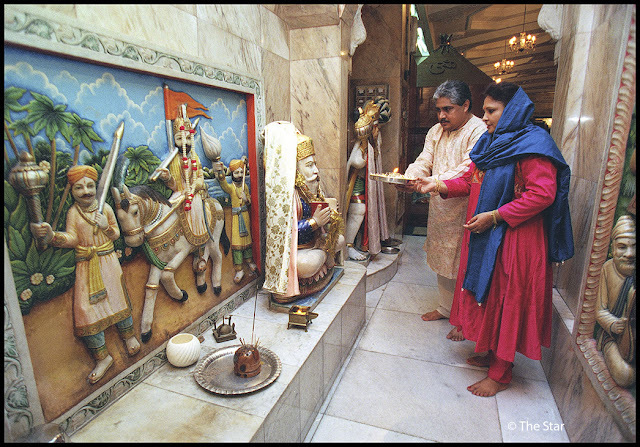 A Sindhi couple perform a religious ritual. Sindhis are defendants of seafaring Indians who wereknown to be the Phoenicians of the East and the original inhabitants of Mohenjodaro, a 7000-year-old Indus volley civilisation. Usually identified through surnames that end with 'ani' which literally means'child of', the close-knit community of 700 in Malaysia is successful in business ventures such as real estate, departmental stores and the jewelry trade. Their main deity is Jhoolay La'al-u, the Indus god who is believed to have travelled throughout the Sindh province on a palla fish. (The god is portrayed as sitting on a fish.) 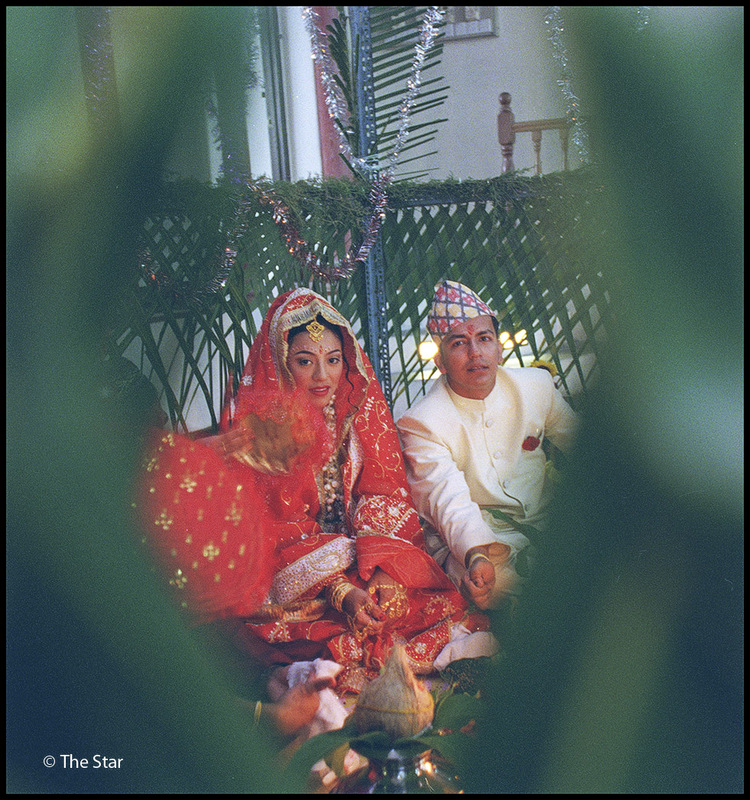 Despite their predilection for arranged marriages within their community, cross ethnic marriages haw occurred, which show Sindhis have adapted to the Malaysian lifestyle. 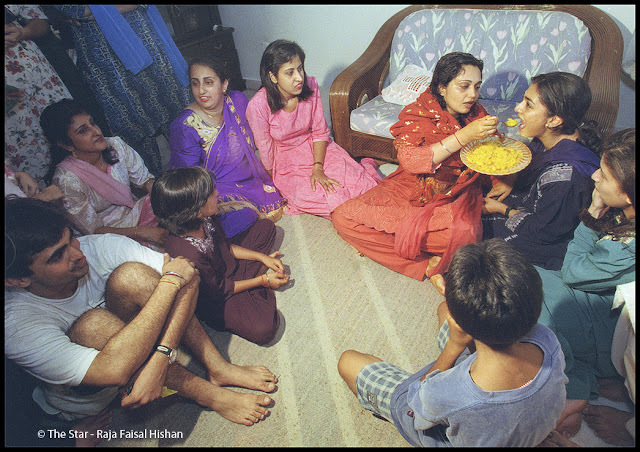 A custom held in high regard by the Gujerati community is Raksha Bandhan which occurs in August. 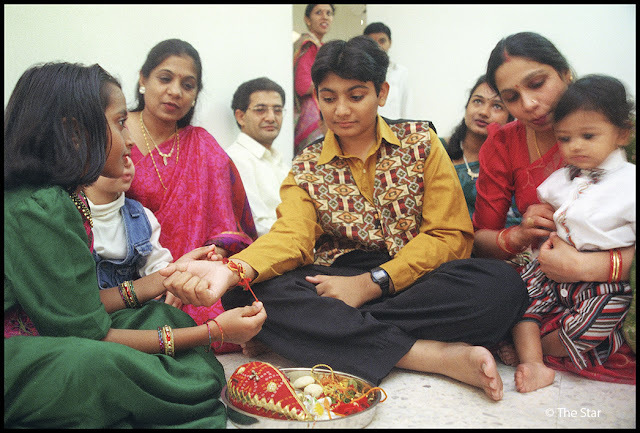 It is a time where the sister(s) in each family tie the rakhi (a gaily decorated velvet patch with a wide band made of coloured thread) around the wrist of her brother(s) to protect him throughout the year against misfortune. The 3,000-strong Gujerati community who are mainly Jains and Hindus are vegetarians and everyone is related through marriage or blood. They were mainly occupied in textile trading but now have diversified into trading other commodities such as tea and palm oil. Many are also engaged in other professions. Malayali ladies have their own unique style of wearing the sari. 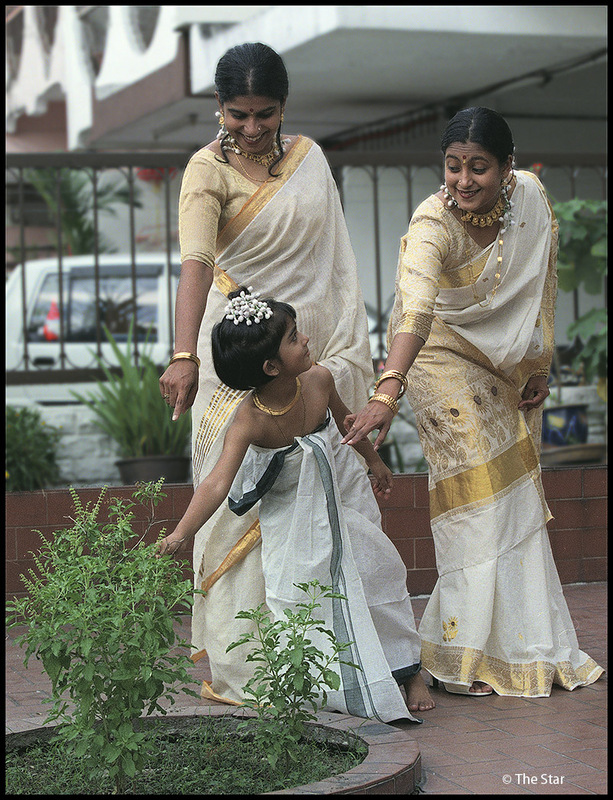 The Malayalis, who originated from Kerala on the Malabar coast in south-west India, follow a system of matrilineal descent known as marumakkathayam, which is similar to that of the Minangkabau in Negri Sembilan. Among the custom observed is the understanding that when a woman get married she is not relinquishing her right to property or other amenities in the house where she was born. However, in Malaysia, this system has not been perpetuated in full by the slightly over 100,000 Malayalis. 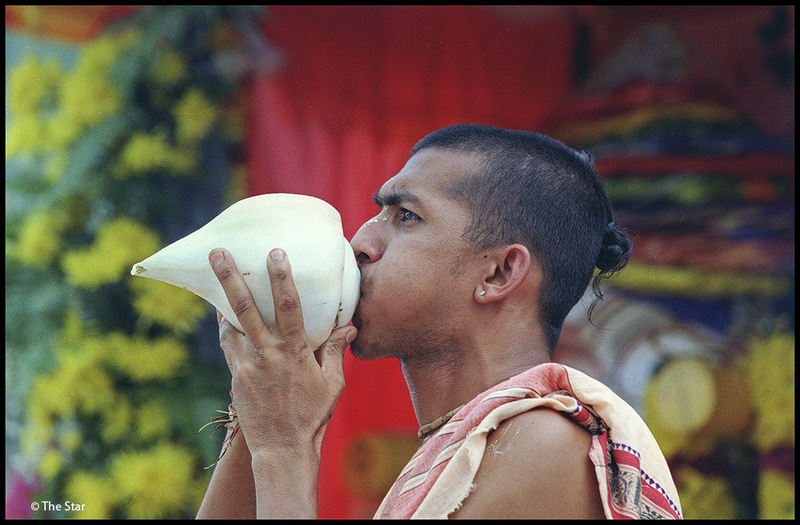 A Hare Krishna devotee blows the conch shell at the beginning of festivals to signify the auspiciousness of the occasion. Members of the Hare Krishna Movement, known as the International Society For Krishna Consciousness Malaysia (Iskon), observe the teachings of the Hindu Vedic literature of which The Bhagavad Gita and the Srimad Bhagavata Purana are the most well-known. A confinement lady tends to a newborn. Most Indian families continue to practice the customary ways of keeping a new baby healthy. Here, the baby is held above a smouldering fire which has been sprinkled with margosa oil, dill water and onion skin. The fragrant smoke will not only make the babies smell sweet all day but keep them from getting a chill as well. 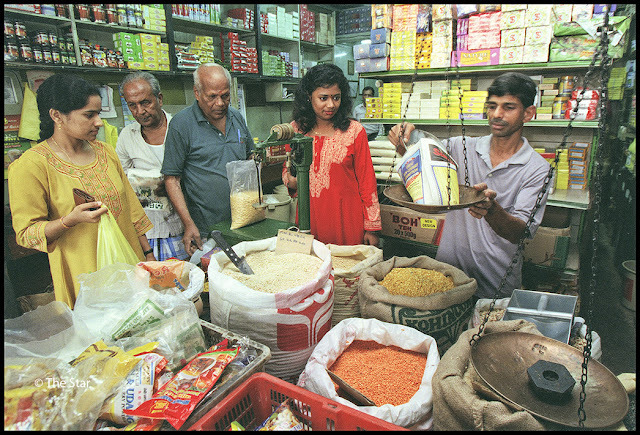 Like some ancient merchant in his magic cave of orange beans and exotic spices, young Mohammed, proprietor of this Indian provision shop, measures out Grade A lentils under the scrutiny of his regular clientele. The small corner provision shop has traditionally been run by traders from India, most of whom still maintain close ties with family in their country of origin. Their time-tested wares range from dried chillies and spice powders to ayurvedic soaps, mosquito coils and onam water (remedy for stomach ache). A deft hand is required in the preparation of some Indian delicacies such as roti canai. 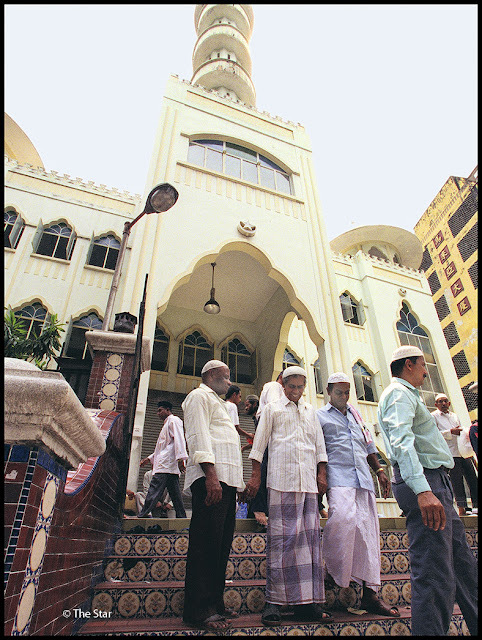 Men take time from their nearby businesses to to discuss politics, the economy and news from home after Friday afternoon prayers at Masjid India, one of the more famous Indian Muslim mosques in Kuala Lumpur. Much of Masjid India's facade has evolved over the decades, its vintage perceivable only by the moss-eaten gate posts and the period tiles which seem to have been saved, for now. Pyramids of all good things to eat served nasi kandar style. Its origin is attributed to Indians who, in their early days of trading, introduced many shared herbs and food plants such as tamarind, garlic, shallots, ginger, turmeric, chilli and pepper from or via India. 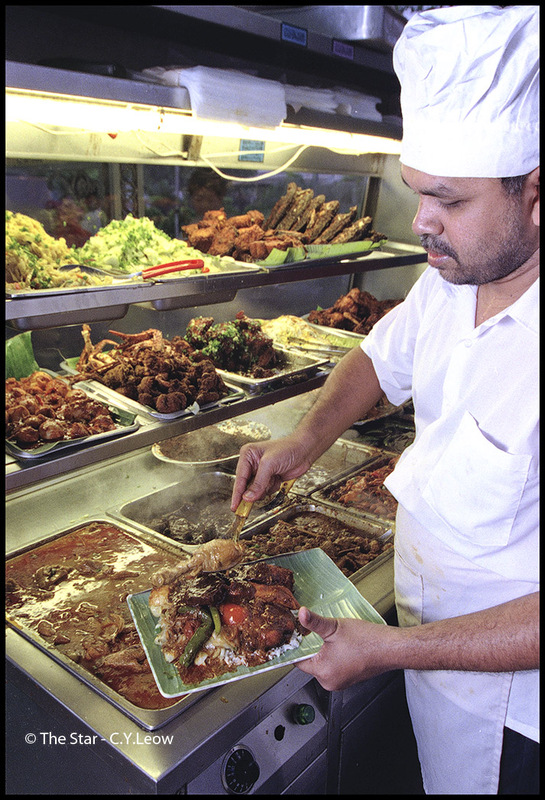 The trade also introduced strong culinary influences, especially from Muslim India since their acceptance was easier within the Malay Muslim make-up. This completed the section on Indian community. Very lovely presentation! I would like to contact this blogger / photographer. Best wishes.